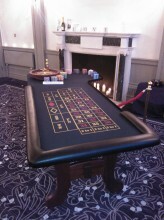 This year why not make your prom all it can be and add the excitement and glamour of a TIER – Fun Casino. All the fun of a real casino but with none of the risk as we only play with “Fun Money”. Play a few chips on Roulette or some hands on Blackjack and see if you could be a winner! We also give you a prize for the player with the most chips at the end of play.